Residential plumbing problems are the most widespread problems these days. People often struggle with the dripping faucets, slab leaks and above all the most irritating sewer problems. Therefore, the best way to avoid residential sewer problems is to prevent them. You have to perform work in order to detect them, because detection is the first step towards solving the problem. You have to start only after proper diagnosis and detection. At such times, drain and sewer cleaning professionals can perform efficiently. You also need to call expert professionals if you have stand still water in your kitchen or bathroom. Our experienced and licensed plumbers can rooter your sewer or unblock your drains to get your life back to normal instantly. Plumbing experts first inspect sewers in order to locate hard to detect problematic areas. This complete diagnostic method should also be considered as a vital part prior to purchasing a home also. Professionals can conveniently detect broken or offset pipes that are below the surface that can gradually cause sewer backups or even slow drains. Using a technically advanced and high-precision camera with a high power LED light, they can focus any problem and analyze it on a crisp screen. It not only helps you to take fast and prudent decision but also help plumbers to work on a particular area. 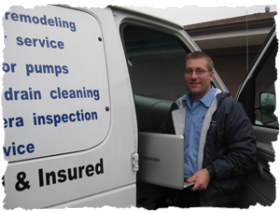 Upon complete meticulous and detailed inspection of your sewer leak, they may simply recommend a repair or replacement. Even a spot sewer repair can save the entire replacement cost. Sewer specialists know how to get the job done right at the first time, this is the reason they also offer drain cleaning services at the same time. For sewer repair, they can renew a broken section and improve the flow of water. Sewer replacement is a big and daunting task. It is not only expensive but also requires heavy labor and expertise. However, it is the owner who decides on the replacement. Plumbing service providers can easily replace the sewer system with the very limited impact on your landscape. After they assess the exact sewer problem, they recommend either the pipe bursting, drain cleaning or the pipe lining replacement method, whatever is more suitable as per the conditions.